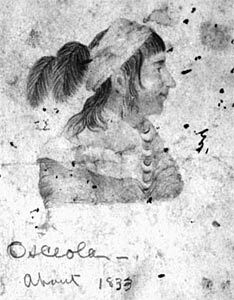 Sketch of Osceola by Henrietta Weedon. The sketch is believed to be Weedon's copy of the sketch by army topographer John Rogers Vinton, made around May of 1837. Vinton's was one of the few images from life of Osceola, and it was the source for many later images. See the many faces of Osceola in key images to look at more images of him. Florida Photographic Collection. Osceola became the country's most famous Seminole warrior, but in an interesting twist, he was also the Indian most strongly allied to the Black Seminoles. Lacking hereditary claims to leadership, he drew most of his immediate followers from the Mikasukis and the maroons. On two occasions when U.S. forces encountered his band, it consisted overwhelmingly of blacks. Drawing power and prestige from his association with the maroons, Osceola was understandably outspoken in defending their interests.